Dr. Joshua Maxwell is a native Texan, born and raised in Dallas. Dr. Maxwell accepted a scholarship from Baylor College of Dentistry to complete his Doctor of Dental Surgery degree. While at Baylor Dr. Maxwell took advantage of the extensive surgical training and the advanced dentistry curriculum available. As a matter of fact, Dr. Maxwell was the first student at Baylor College of Dentistry to use computer aided technology to complete a cosmetic smile makeover case! Dr. Maxwell is always adding to his impressive list of advanced training, and makes certain that he remains on the leading edge of dental technology, knowledge and skill. Through extensive, advanced level training and successfully treated peer reviewed implant surgeries, Dr. Maxwell has obtained the distinguished title of Fellow within the International Congress of Oral Implantologist. He continues to further his education with advanced courses, while working on fellowships in the American Academy of General Dentistry, American Academy of Implant Dentistry, World Clinical Laser Institute. 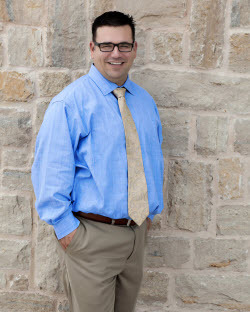 He was the first General Dentist in the Frisco area, and one of only three in the DFW area to be considered an "Invisalign Premier Preferred Provider" (usually reserved for Orthodontist) by Invisalign Clear Aligners due to the amount of successful Invisalign Clear Aligner patients treated. Due to Dr. Maxwell’s extensive continued education and training, he was honored as “America’s Top Dentist" 2011 and 2012 by the Consumer Research Council of America! Dr. Maxwell was also voted "Mom Approved Dentist" in 2013 by the readers of Dallas Child Magazine. Dr. Maxwell has built a relationship of trust and a reputation of excellence within the Frisco and surrounding communities, and in 2012 became the "Official Team Dentist" for the Frisco based Dallas Mavericks affiliate, The Texas Legends NBA-D League led by Coach Eduardo Najera. Dr. Maxwell is also an active member of the American Academy of General Dentistry, American Academy of Implant Dentistry, American Academy of Cosmetic Dentistry, American Dental Association, Texas Dental Association, North Texas Dental Society, and the Texas Academy of General Dentistry. Renew Family Dentistry is also a member of the Frisco Chamber of Commerce. Dr. Maxwell is continuing to build your dental home by constantly adding new state-of-the-art-services and the latest dental technology to insure your comfort and optimal dental health. He believes in always staying ahead of the curve through consistent continuing education, not only for himself, but his entire team and regularly invests in their professional advancement as well. He only uses the absolute best materials and dental labs, and at the same time, provides this high quality of dentistry at a reasonable cost! Renew offers a full range of dentistry for the entire family, from infants and beyond. Dr. Maxwell has a passion for Cosmetic and Implant dentistry, as well as Family dentistry, patient education, and prevention! Dr. Maxwell maintains a relaxing spa-like environment while utilizing techniques designed to make dentistry pain free from start to finish. Dr. Maxwell’s greatest passion is for his family, where he spends his leisure time at local sporting events, movies, musicals, and horsing around the house with his boys. Dr. Maxwell and his family reside in Frisco.